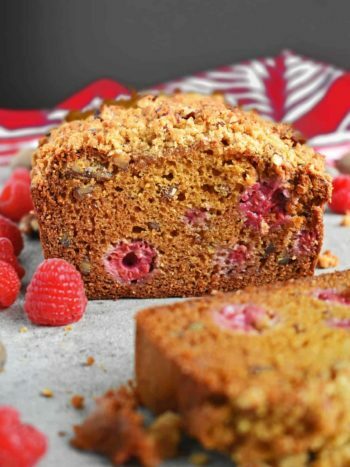 Banana Cranberry Bread is perfectly moist, slightly sweet and loaded with sweet tangy cranberries. This is one of our favorite banana bread recipes and it’s wonderful in every way. This bread is great for the holidays, any company, brunch or snack time. 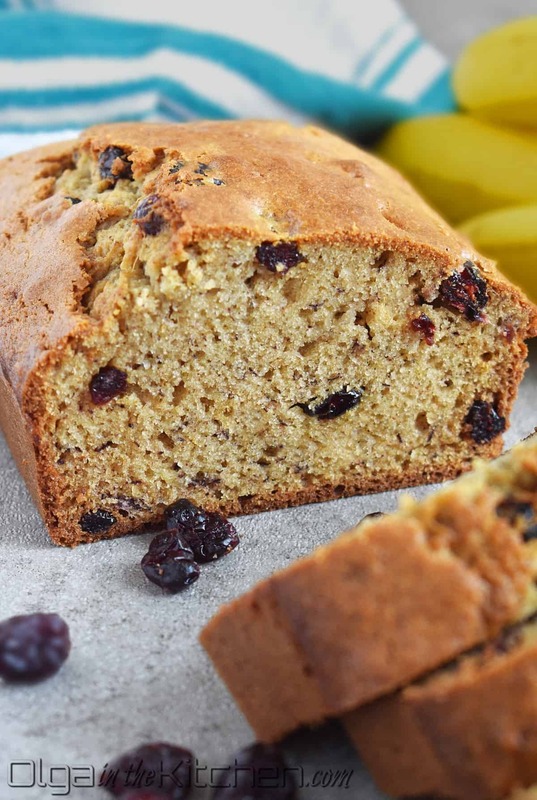 The combination of sweet banana with the tart cranberries in each bite is simply irresistible. The addition of cinnamon, nutmeg and cloves really bring those memories of autumn days, making this bread perfect for fall season. The aroma running throughout the house from these 3 delicious spices just remind me so much of the first days of autumn. 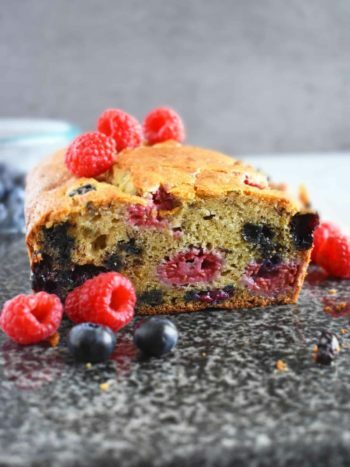 Some other easy bread recipes you may want to enjoy are Banana Berries Bread, Apple Blueberry Honey Bread and Raspberry Pecan Honey Bread. 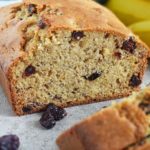 Can I Freeze Banana Bread? Yes! This recipe works great with freezer option. Place a whole sliced or unsliced banana bread into a Ziploc freezer bag, remove excess air and thaw when needed. You can also slice the bread and freeze each slice in a Ziploc snack bag. Take out frozen bread into refrigerator overnight to thaw. Most of the times, I even like to microwave for 15-20 seconds and the bread is once again like freshly-baked. Don’t ever throw away bananas! If you have overripe bananas and are not ready to put them into use, freeze them. Place unpeeled bananas in a freezer Ziploc bag and remove any excess air. Freeze up to 3 months. 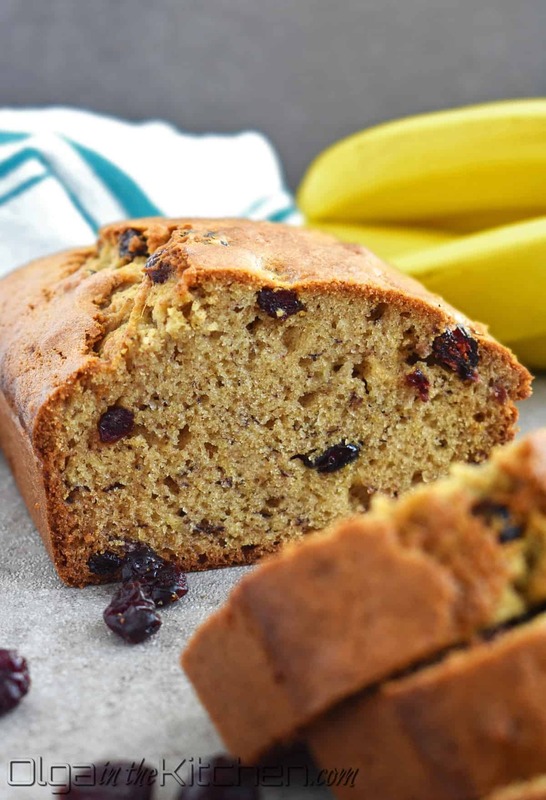 Every time you want to make this delicious banana bread, thaw banana or couple and ta-da! You can also peel and cut bananas into pieces and use them in smoothies. Absolutely yes! In fact, I do it a lot. Neither of my kids like cranberries in desserts so I omit them more than half of the time. 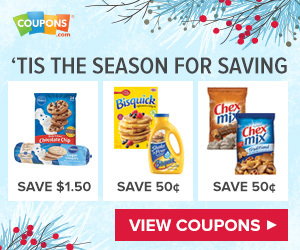 This recipe will still work without them. If you like nuts, you can substitute cranberries for nuts. If you like chocolate chips, substitute them for chocolate chips. 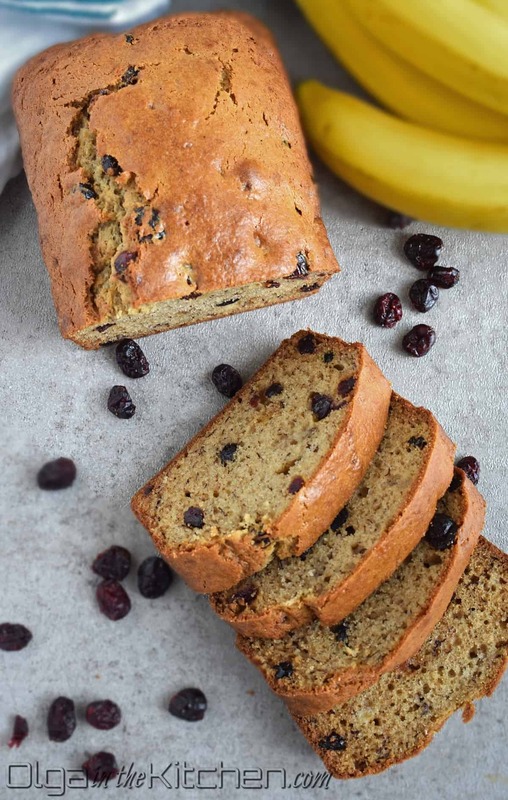 Whatever way you decide to enjoy this scrumptious banana bread, it will still be the softest and the best banana bread you will ever eat! Be sure to use room temperature ingredients such as eggs, bananas and sour cream. If using frozen ripe bananas, thaw them overnight and let them come to room temperature. If you’re a big cinnamon fan, you can definitely increase the amount of cinnamon needed in this bread and really experience the autumn with each bite! Mash bananas until they are applesauce consistency. Let the bread cool for 10-15 minutes and transfer onto a cooling rack until fully cooled. Allow bread to cool completely before slicing, Enjoy fresh or freeze to enjoy a month or two later. 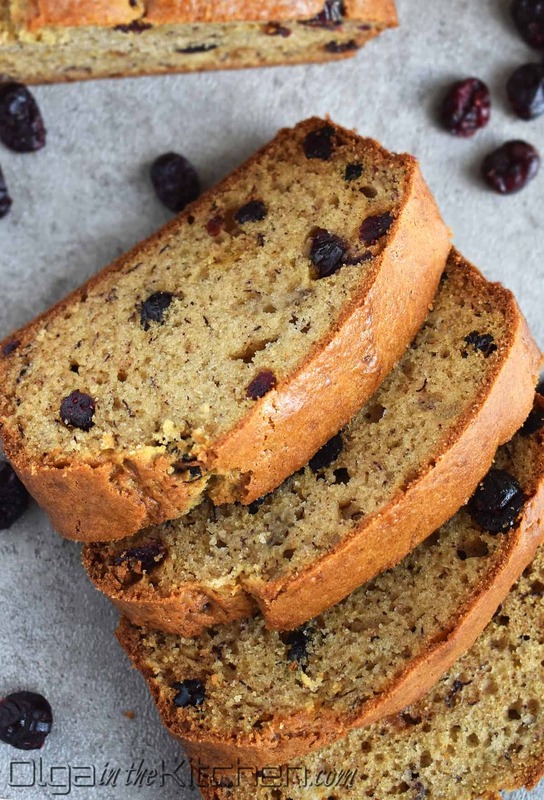 Banana Cranberry Bread is perfectly moist, slightly sweet and loaded with sweet tangy cranberries. 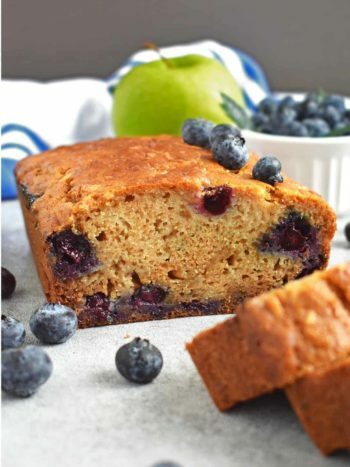 This is one of our favorite banana bread recipes! Preheat the oven to a 350°F. 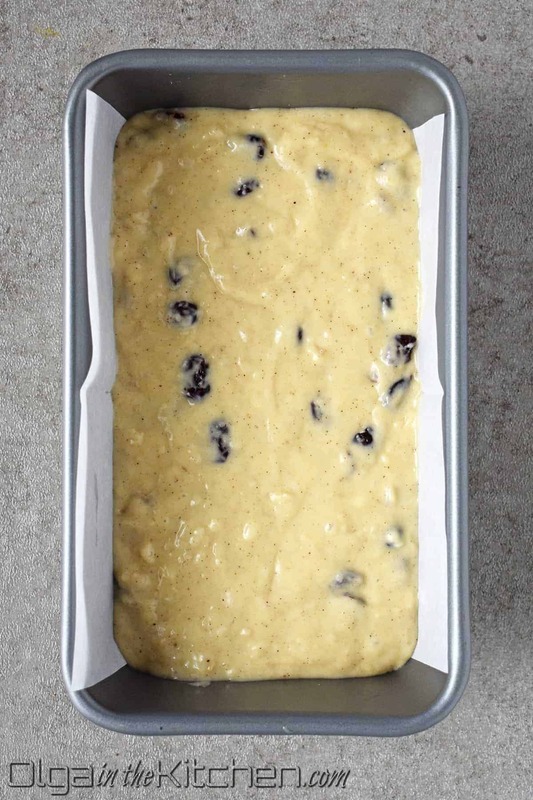 Butter or spray a 9x5” loaf pan. Line a parchment paper with the loaf pan for easier take-out once the bread is baked. In a medium bowl, combine and whisk: 1 1/2 cups all-purpose flour, 1 tsp baking soda, 1/2 tsp salt, 1/4 tsp ground cinnamon, 1/4 tsp ground nutmeg and 1/8 tsp ground cloves. Stir in 1 cup dried cranberries. In a large bowl, mash 1 banana with a fork. 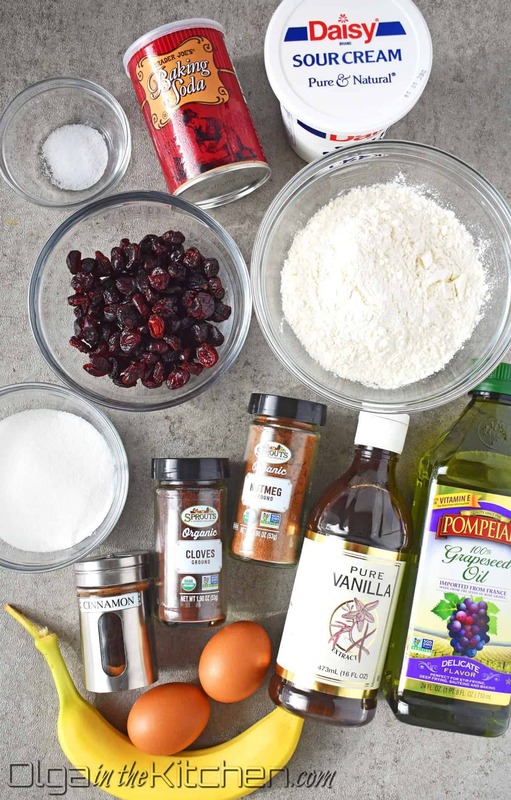 Add 1/2 cup granulated sugar, 2 large eggs, 1/2 cup sour cream, 1/2 cup grapeseed or vegetable oil and 1 tsp vanilla extract. Whisk to combine. 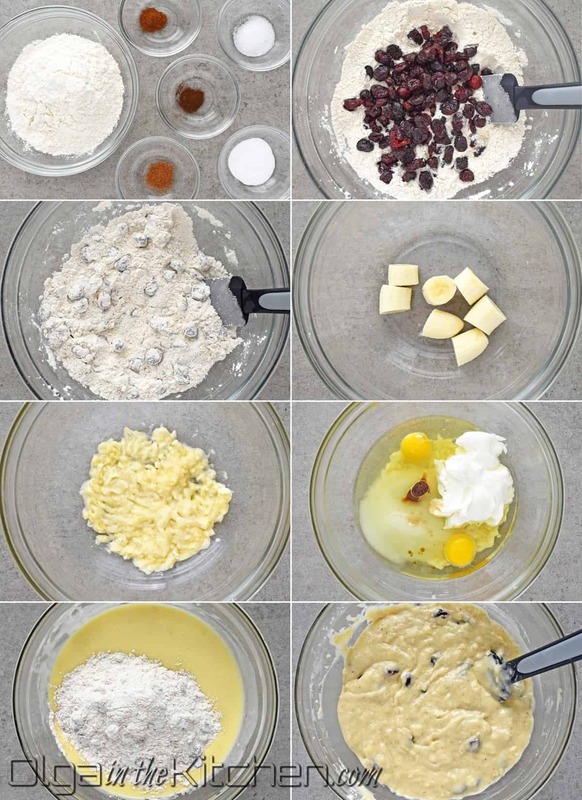 Using spatula, stir in the dry ingredients into the batter, until ‘just combined’ – do not overmix! 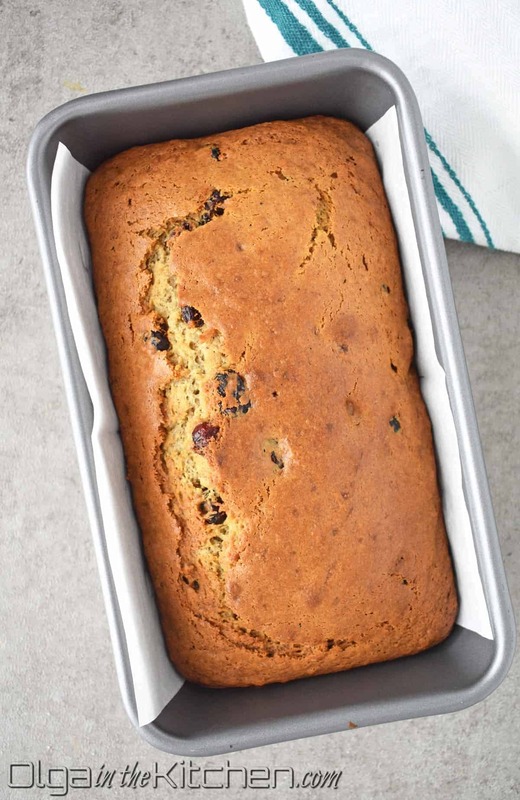 Pour the batter into the prepared loaf pan and gently go over with spatula to spread evenly throughout the pan. Bake the bread for 45-50 minutes (I did 45) or until a wooden pick inserted in center comes out clean. Let the bread cool for 10-15 minutes and transfer onto a cooling rack until fully cooled. Enjoy with cup of coffee or tea!